We had experienced some curious auto thefts where a suspect was seen pointing something at a victim’s car, then opening the door and driving away. The owner’s keys were still inside the house. We had it all on surveillance video and it was puzzling. This type of theft occurs by a relay attack. Passive Keyless Entry Systems are the latest technology that let drivers walk up to their car and open the doors or trunk without pushing a button or touching a key. As long as the fob is in your pocket or purse, you are hands-free to get into the vehicle. Once inside the car, the driver uses a start button to fire up the engine. Again, no touching the key. PKES’s employ low frequency radio signals to set up communications between the key fob and car. As a safety feature, the fob needs to be in close physical proximity to the vehicle. Using commercially available power amplifiers, criminals boost the low freq signals and relay them, causing the car to think the key is within its operating radius. An amplifier allows the suspect to unlock the car’s doors and start the engine when the keys are actually far away, say, inside the owner’s house. This is what we had been seeing. Perps walk up in the darkness and make off with the victim’s vehicle. Science, not magic. The power amplifiers are readily available on the Internet, some for very low prices. The National Insurance Crime Bureau (NICB) posted a short news video about digital car thieves on their blog in April of this year. The technology to defeat PKES’s can also be used to circumvent standard keyless entry fobs, where you point your key at the car and push the unlock button. Many different vehicle makes and models are vulnerable. A way to prevent auto burglary and auto theft through a relay attack is by using something for radio frequency signal isolation to block the key’s communication. This can include placing your fobs in a faraday bag (which blocks radio waves), the freezer, or even wrapping key fobs in aluminum foil. I was a bit freaked out when I read about relay attacks because my department-issued detective vehicle has a PKES. Anyone with a power amplifier could have made off with the car, my AR-15, Sig Sauer pistol, lots of ammunition, hard and soft body armor, and my favorite tomahawk. Not good. After wrapping my PKES fob in aluminum foil, I went out to the vehicle and, sure enough, it would not open until I had extracted the key from the foil. Simple and handy. 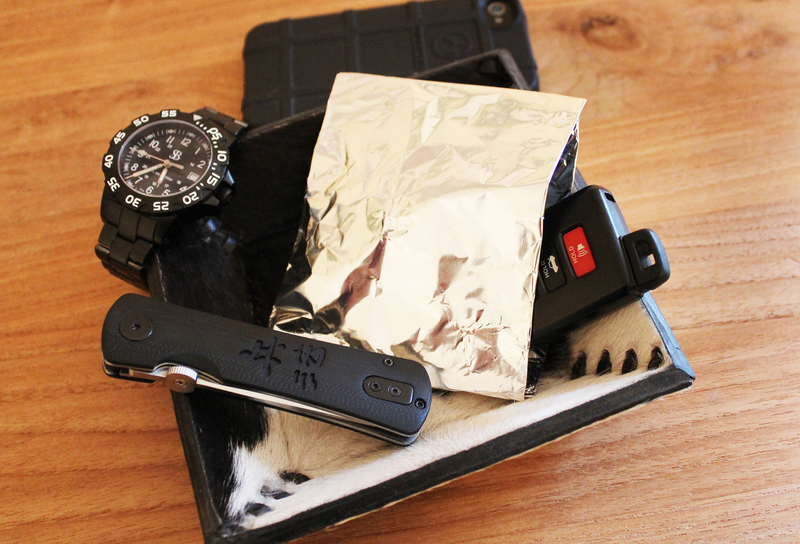 I have since made a temporary pouch for my keys from foil and ordered some inexpensive faraday bags for more permanent safety. POV keys will go into the bag at night, as well. The auto industry will have to work on tech solutions for this theft problem from their end, but at least we can be aware of the threat and take precautions to minimize our susceptibility to it. This entry was posted in Detectives, Street, Technology and tagged auto theft, keyless entry defeat, relay attack. Bookmark the permalink. So not sure if this would be a practical solution ??? Could we wrap ‘Grand Theft Auto’ “vermin” in an American flag, parachute them into Afghanistan and then tell them there is a free ‘ride’ “home” when they reach Baghdad??? I mean its like overseas and stuff so there should not be any legal “issues” that would prevent that from being a ‘suitable’ “rehabilitation” option; right ??? And they said my tinfoil hat was useless. Little did they know! It also keeps the government radio waves out of my head as a shiny hat!